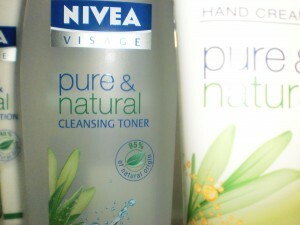 I recently recevied a lovely package from NIVEA, featuring an array of products from their new Pure and Natural range. I can’t stress how nice it was to see a selection of products made up of 95% natural ingredients. The way the Fashion and Cosmetic world is working recently is to a heavy focus on ‘Natural’ and ‘Sustainable’ product ranges, and although we are seeing more of this, it’s still not as common as it should be. With Nivea being a leader in the beauty and cosmetic industry, I wasn’t suprised to see they are taking the next step in consumer demands by launching this fabulous new range. Free from Parabins, Silicones, Colourants and Mineral Oils, the new NIVEA Pure & Natural Face, Body and Hand Care products have been developed by scientists and are currently on sale from the 20th February at affordable prices. Prices of this new range are to start around the £1.99 mark, which is brilliant of NIVEA to continue their USP of selling quality products and value prices. I have always been wary of what I’m putting on my skin, not really to the extent that I make sure every facial care product is 100% organic, but I like to try and keep all those scary chemicals to a minimum. So as I’m sure many of you out there have a similar beauty ethic as me, I decided to test the products, so here’s how I’m rating them! The NIVEA Pure & Natural Facial Moisturising Day Cream for normal to combination skin is packed with Moroccon Argan Oil and Aloe Vera, known for its replenishing properties. The Day Cream claims to give skin full hydration and nourishment. I put this cream on after washing my face, and it has a silky smooth texture which easily blended into my skin. There’s nothing worse than a moisturiser which gives a greasy feel, and I definitley did not get that from this cream. It has a light, fruity fragrance, and comes in a little glass jar with NIVEA’ s trademark simple labelling. If you have skin that gets easily irritated or prone to blotches/redness, then this cream will work wonders for you with its natural ingredients and lightweight feel. Day Cream costs £5.10. Nivea Pure & Natural Cleanser and Toner both come in at a snip of a price at £3.36 each. For the ultimate skincare regime, these products are designed to work in harmony to gently wipe away dirt and grime, encourage cell regeneration and help to protect against free radicals. The cleanser comes in a milk/lotion formula, which is personally my favorite type of cleanser. I once read an article about how face wipes are just as bad as using a kitchen cleaning wipe to clean your face, and since then I’m very much obsessed, shall I say, with using a ‘proper’ cleansing product. I was very impressed with this particular cleanser, after using it for the first time it removed all traces of make-up and left my skin feeling fresh, with no red marks like I am sometimes prone to. On the other hand, I have never been a toner user. I can’t exactly tell you why because I don’t have an exact reason for it. Maybe because I always aim to keep my skincare routine simple and avoid product overload. However, for the past month I have trialled using NIVEA’s toner after cleansing and have experienced no problems whatsoever. The toner made my skin feel slightly tighter (but in a ‘this-product-seems-to-be-working kind of way) and was gentle enough to use every night. It has definitley got me re-thinking about introducing a toner to my usual skincare regime. NIVEA’s Pure & Natural Anti-Wrinkle cream was an exciting product to use. At the spring chicken age of 24, I can thankfully say I bear no wrinkles, therefore can’t really say if this product helped with this area. However, I can say that it is proven to significantly outperform the world’s best-selling competing Anti-Wrinkle cream in terms of effectivness, comfort and fragrance, and it does indeed have a lovely fresh fragrance that made me want to pile on this product. It uses Burdock Fruit to support the collagen of the skin, helping the skin to remain firm and younger looking. I am more than happy to continue using this product, and you never know, it could help fight off those first signs of wrinkles for another few years! I have to say I am fairly new to the whole hand cream usage regime. I recently bought a Jergen’s handcream which seemed to do the job however came in a very small bottle which I ran out of in no time. NIVEA’s Pure & Natural Hand Cream provided a creamy formula which sank in straight away (always a plus, no one want slippy hands) and I found I didn’t need to re-apply the product for the rest of the day. Luckily, I don’t suffer very dry hands, so this light and non-greasy formula cream is right up my street. For £3.00, it is worth purchasing to give your hands some TLC! And saving the best until last…. 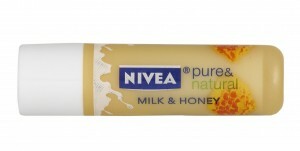 NIVEA’s Milk and Honey Lip Balm for the bargain price of £1.99. Cute packaging and perfectly pocket-sized, this lip balm smells sweetly of milk and honey, and is so delicious it’s good enough to eat! Contains Shea Butter and Jojoba Oil aimed to protect lips and leave a super soft pout. I have used this product numerous times each day over the last few weeks and feel it gives me incrediably soft lips, with a moisturised feel. Love love love this lip balm! It will be replacing my trusty vaseline! I would recommend this range to all you health and beauty conscious ladies out there, not just because the range contains natural ingredients (although always a bonus), but also because the products are genuinley good value for money, with effective packaging and really deliver results. What are you all thinking? Nivea is one of my favourite budget ranges for beauty. My mum has always sworn by Nivea products and she has AMAZING skin! I will definitely be giving the pure and natural range a try.